In the floor-and-ceiling drug resupply method, an inventory management system restocks drugs up to a site’s storage capacity, or “ceiling” level, whenever it has been depleted to protocol minimums (the “floor” level). Typically, individual unblinded drug types (e.g., active and placebo) are counted separately for the floor level, and whenever either type reaches floor level, both types are restocked to ceiling level. 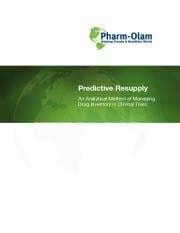 In this whitepaper you will learn why the floor-and-ceiling method is not adequate for all studies and it will outline Pharm-Olam's 5-step algorithm that can cut costs and ensure adherence to study protocols.